Chronic back pain is a very common complaint that in most cases can be treated and controlled with conservative measures such as physiotherapy, pain medication etc. However, in some instances a sick lumbar disc can be the origin of persisting invalidating lumbar pain. This condition called discogenic lumbar pain can be treated by a replacement of the entire disc with lumbar disc prosthesis such as the 'Maverick' prosthesis. In some instances, in younger patients, only the replacement of the disc nucleus that is the inner part, the core of the disc can be sufficient to relieve the pain. 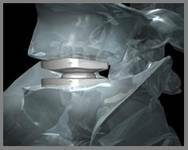 This partial disc replacement device is called the Dascor. Whereas degenerative disc disease can be treated with a lumbar fusion or fixation with screws from the back, often it is preferable to replace the disc from the front. This Maverick prosthesis in the picture maintains the disc height and permits movement. In this way, the vertebral joints can find their normal balance again and the joints of the adjacent, normal segments will not experience abnormal forces. The surgical approach from the front will of course preserve the very important muscles of the back. When in younger patients a degerative disc is causing intractable back pain, often the replacement of the core of the disc (nucleus) is sufficient, providing the annulus, the outer border of the disc, is still intact. In this operation, which can be carried out from the front or from the back with a minimal invasive approach, first the nucleus is completely removed through a small hole in the annulus. Next a balloon is inserted and filled under digitally controlled pressure with a two-component polymer. This polymer cures in 15 minutes and has the same elasticity as a normal disc core. Using an expandable balloon as contention of the polymer permits a perfect 'fit' to the patient's anatomy. In this way the normal function of the disc is restored and the pain is relieved.